The City of Dandenong will play host to a unique cricket and cultural event celebrating Australia Day 2012. The inaugural “Australia Day Multicultural Challenge” will take place on 26 January 2012 at Shepley Oval in Dandenong. Highlights on the day will include an Australian team with Hellenic heritage to play against a Sri Lankan All-stars side in a T20 challenge for the Alex Kountouris Cup. The cup is named after Alex Kountouris who has had a terrific association with both communities, particularly through his work as the physiotherapist for the Australian and Sri Lankan national cricket teams. Alex is a proud Australian with Greek / Cypriot heritage. Twelve teams will also compete in a grassroots 6-Side round robin format for the "Serendib News Cup" with teams ranging from the Melbourne Indian All-stars to the Melbourne Hellenic Cricket Club, Sunshine Heights and the St Michaels Colombo Old boys. The fast paced 6-a-side format features 5 over’s per innings and no LBW's will unite cricketers from the Sri Lankan, Greek, Indian, Pakistani and Afghan communities combined with local Dandenong cricketers will ensure there is plenty of entertainment for spectators.. 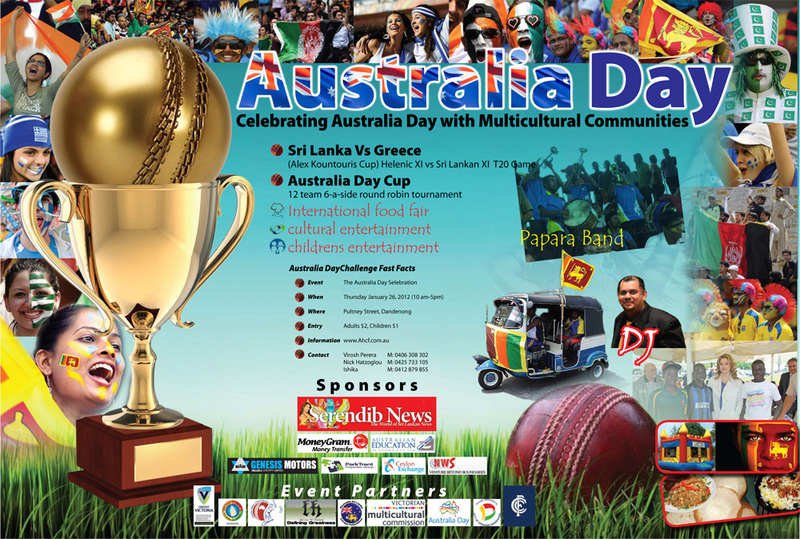 The Australia Day Challenge will feature cricket activities by Cricket Australia, cultural performances and an international food fair showcasing delicious Sri Lankan, Indian and Greek food. Virosh Perera is the event Organiser and Chairman of the Australian Sri Lanka Cricket Federation and is thrilled the event is taking place. "We have talked about a cricket event on Australia Day for years and I am glad that this day has finally come"
"The Sri Lankan community welcomes family and friends of all communities to this event and together we will give thanks to our adopted country and showcase the successes of Multiculturalism in Victoria." Mr. Perera added. Dandenong Premier cricket all rounder James Nanopoulos has been selected as the captain of the Greek XI and is looking forward to taking on the Sri Lankan team. "It is well known that the Victorian Sri Lankan community is passionate about cricket and has a lot of good players but don't underestimate the passion of the Greeks for the game we love. “We know we are the underdogs and it will be a proud moment to assemble some of the best Australian / Greek cricketers and see how we perform as a team." Former Sri Lankan test cricketer and 41 test veteran Asanka Gurusinha will be the special guest at the event and present the trophy to the winning team. The Sri Lankan team will be captained by former Sri Lankan test player Athula Samarasekera. "We invite everybody to join us and celebrate Australia Day. There will be entertainment for the children, wonderful Greek and Sri Lankan food and guaranteed exciting cricket. May the best team win" said Mr. Gurusinha. The Australia Day Challenge is launched in partnership with the Australian Hellenic Cricket Federation who’s President, Nick Hatzoglou said today "We are thrilled to be working closely with such a strong cricket loving community as the Sri Lankans on this event.” “The Greek community is an established and successfully integrated Australian community and we consider it our obligation to work with newer migrant communities to build a more inclusive Australia - and what better way to build bridges than through our national sport of cricket." Added Mr. Hatzoglou. The Australia Day Challenge is proudly supported by the Victorian Multicultural Commission, City of Dandenong, Cricket Victoria, OPA magazine, Carlton FC, Exdclusive World Travel, Australia Day Council and Serendib News.